Sorry Obama, but placing foreign governments that sponsor terrorism above your own citizens is never going to fly. Even your own party saw the damage opposing this bill would have come election day. America first, now and forever! The Senate on Wednesday voted to override President Obama’s veto of a bill that would allow the families of 9/11 victims sue Saudi Arabia, striking a blow to the president on foreign policy months before he leaves office. 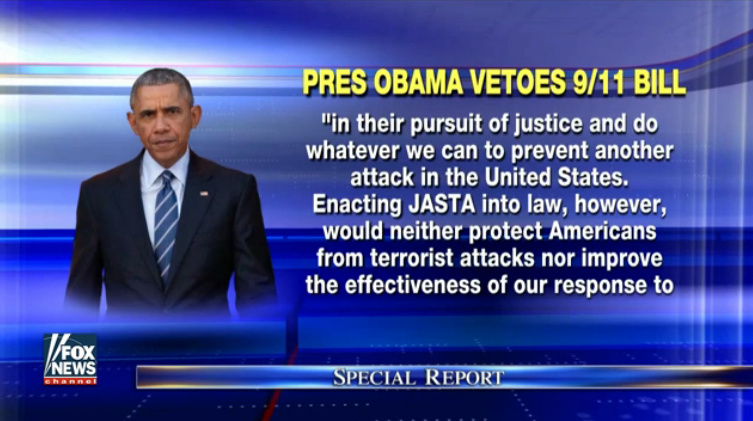 The 97-1 vote marks the first time the Senate has mustered enough support to overrule Obama’s veto pen. Senate Minority Leader Harry Reid (D-Nev.) was the sole vote to sustain Obama’s veto. Not a single Democrat came to the Senate floor before the vote to argue in favor of Obama’s position. Lawmakers don’t want to be seen as soft on punishing terrorist sponsors a few weeks before the election, at a time when voters are increasingly worried about radical Islamic terrorism in the wake of recent attacks in Manhattan, Minnesota and Orlando, Fla. The House will take up the matter next, and Speaker Paul Ryan (R-Wis.) told reporters last week that he expects there be to enough votes for an override.